Using and Defining Bleeds | Kenwel Printers, Inc.
Kenwel Printers requires a bleed of 0.125″ (1/8″) when required. If your finished print design will have color, graphics and/or images that extend all the way to the edge of the finished piece, you will need to add bleed — or an extra measure of width and length — to your page size, and extend the color, graphic and/or image to this extra width and length. 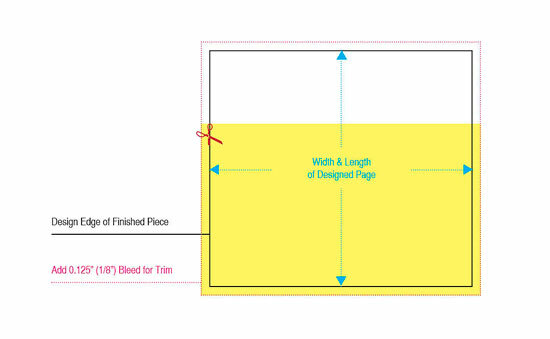 In producing your printed item, we will print the larger dimensions, and trim back to the finished page size to create your finished piece, thus producing an edge with no white margin.